Well, mission accomplished!! After a fews days of hard riding we finished it off. 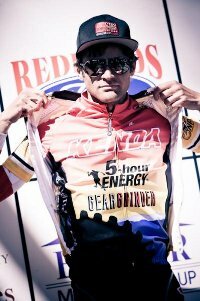 Phil Gaimon of Kenda/5-hour Energy won the GC at the Redlands Classic. From my perspective it was a bunch of hard riding on the front. Friday you know about, but it didn't stop there. Yesterday's crit was a crit. We rode the front from the start, a little too hard maybe. Then I got a flat about half way through and never made it to the front again. I pulled the plug with about 8 laps to go when some of the other teams took over the front. Got a bunch of courtesy claps before I was pulled. Today's Sunset Loop road race was predictable till it started raining. The 8th and 9th of the 12 laps was where it got hard. I'd get dropped on the climb, claw back to front, do what I could only to get dropped again. That didn't last long. I'm not really sure how the finish played out, you'll have to read that elsewhere. All I know is that Phil won and that makes me happy. It's been a great week and riding with my team has been awesome. I'm thankful for the opportunity to ride for them. Looking forward to more results to come.